to adapting to the world around it. As a result of this, Red Bulls’ revenue reached £3,315,580,515 in 2010, which is an astonishing amount. Red Bull has established their brand exceptionally. They are practically everywhere. The energy drink is in a position where it does not need to be advertised anymore because of its well renowned name. The first and most obvious factor for Red Bull is their sponsorship. If you tune into any form of sport, it will be very difficult not to find them as a sponsor. Their most famous would be their Formula 1 sponsorship, but they are active in other sports such as WRC skiing, the MotoGP, FreeRunning, Sailing and many, many more. The sponsoring of “extreme” and somewhat dangerous sports gives Red Bull an obvious and again subconscious link to those behaviours and it is another form of advertising. By putting Red Bull out there on this sort of scale, the company are really exposing the product as much as possible. As good as their sponsoring efforts are, this is not the main focus for this article. Their social media efforts raise the most eyebrows. As previously stated, Red Bull does not need to resort to social media and sponsorship anymore, due to their huge exposure. Similarly, the energy drink does not depend on social media to bring in the business. That being said, they have a collective, dedicated follower total of 22,883,561! Again this is an insane amount but let’s brake each platform down. We start with the platform that has acquired the most fans, and is possibly the network that has received the most love. One of the first things that would jump out to any new visitor, or non-fan, would be the reveal tab, which asks the visitor to like the page. Before Facebook’s update, this would have served as a block and would have been the only thing available for those who hadn’t liked the page. This obviously prompted the visitor to like the page. Since the update, you cannot restrict access to non-fans , but you can however select certain tabs to be the default landing page. This tactic still works when it comes to receiving more likes but not on such a huge scale. Besides the landing page, another factor which sets aside the Red Bull page from many others is that for each tab they have not used the static HTML app that many fan page owners use. They have created their own app, dedicated to each topic or tab, covering these topics: their Athletes, a live feed to Red Bull TV, a collection of Games and Apps, the latest Red Bull news and available Red Bull careers. The Red Bull wall is filled with content, mainly videos and pictures from their events. Also media and news is shared that is relevant to their audience, one example would be the latest SSX snowboarding video game, created by EA Sports. One of the most recent additions to Facebooks’ updates is the active users’ display where you can see how many people are actually talking about the page. 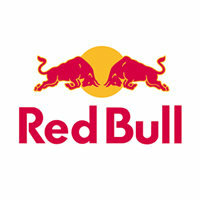 Red Bull has 135,313 users that are active. They have an active user base of 0.6%, which when you put it that way does not seem like a huge amount. However their figure of 135,000 active users is a huge amount. Twitter is the host of 352,975 of Red Bulls’ fan base. It is safe to say that this could possibly be the home of most of their engagement as from first glance you can see that replies practically eat up their Twitter feed. Engagement is difficult for any social media profile to obtain, but to have a high majority of your tweets being replies is a great sign. Because of Twitter itself, the amount that can be done is fairly limited, but they have been verified as the “real” Red Bull and have decorated the page as such. Besides the engagement, the rest of Red Bulls’ content consists of funny text, such as “Here’s a trick when you don’t have a Bull: Hold a 100 dollar bill out the window while driving. That’ll keep you awake!” Their Tweets also include promotions for their latest events. We now come to the home of 1417 videos, which have amassed a total of 202,053,825 views. This amount of views has naturally converted into 246,174 subscribers. Not disappointing the other platforms, these figures are truly astonishing. All of the content on Red Bulls’ YouTube channel is coverage from their events, so their channel is one of the first stops for extreme sports online. Again this gives great exposure to their brand and its association with these types of activities. Red Bull have done a fantastic job with their social media. It not only exposes their brand but also their events. We must question whether the focus of their advertisements revolves around the product or events. From this research, it appears the events are the main focus because they are what need it, not the product because it has established itself as an international energy drink. This article was written by Lewis Austin, who is a social media manager for SEO Positive, for more information about SEO Positive, make sure you follow their Twitter account and blog for all the latest news. I like the article, but I think you are wrong in terms of the sponsorship. They don’t sponsor the F1 team, they OWN it. It’s the same with all the extreme sports, they own all the teams. Rarely, if ever, do Red Bull sponsor anything, they just buy it. @Mark, thanks for pointing that out, although this article was not focused on the extreme sports side, it was based on the social media aspect, I just wanted to acknowledge their other efforts. It’s amazing how red bull have come a long way and yet the use of social media still has a room for them. The figures are really informative yet awesome! Never had such kind of information from red bull. Indeed a well researched information Lewis. Everybody can tell by the figures but what’s more surprising to me is the data on their social media efforts. I could just imagine how social media can truly help expand any business, whether big or small business. My small business owes a lot from social media that’s why I’m pretty amazed by such things.